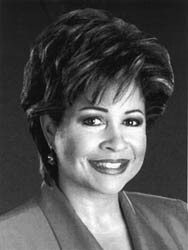 Clarice Tinsley is the lone holdover from 1985's Ernest campaign. Note to readers: It's strange but true. 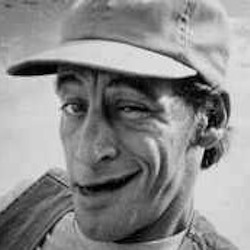 Well before becoming a Fox station, KDFW-TV (Channel 4) used the late Jim Varney's Ernest P. Worrell character to promote its news team. Here are the particulars in a story that first appeared on Jan. 30, 1985. Ernest is climbing a ladder and, as usual, agitatin' Vern. "Hey Vernon, hustle, Vernon. Hurry up and get that old antenna fixed. Channel 4 news is about ready to come on." Just in time for the February "sweeps," KDFW-TV becomes the latest TV station to use Ernest/Vern come-ons. Two 30-second spots, starring Jim Varney's rubber-faced Ernest P. Worrell and his unseen silent partner, Vern, are scheduled to premiere next week. Four more Ernest/Vern commercials will be made in March for Channel 4. Ernest, best known in these parts as the pitchman for Braum's ice cream (he was dropped by the company on Dec. 31)), is doing commercials for local newscasts in 30 TV markets, including Austin, Amarillo, Houston, Lubbock and Harlingen-Weslaco. "We have been able to study the ratings in some markets. There's a definite increase," said Beverlie Brewer, account executive for the Nashville-based Carden & Cherry advertising agency, producer of the Ernest/Vern spots. "Many of our stations report increases not only in the news, but in all day-parts. And they attribute it to the Ernest campaign." Channel 4 needs a quick fix. In the November sweeps ratings period, the station's 5 and 6 p.m. newscasts finished last in both the Nielsen and Arbitron ratings. At 10 p.m., Channel 4 was second. "We like a challenge like that," Brewer said. Besides newscasts, Ernest currently is pitching a wide variety of consumer products in 60 other TV markets, Brewer said. The commercials are written and produced in Nashville. "We have about 125 different shticks," Brewer said. "The stations get to select which shtick they like the best. We re-produce each spot to fit in with that particular gag." The first two shticks picked by Channel 4 are the "Roof/Ladder" and "50-50 Weather" spots. After urging Vern to hurry up and fix his TV antenna, Ernest affects his best basso profundo broadcast voice and says, "Whatever it takes, wherever it breaks." Then, in Brewer's words, Ernest flashes his patented "huge, ridiculous, silly grin" before getting down to specifics. "Clarice Tinsley, Steve Bosh, James Spann and Paul Crane have got it all," he tells viewers. "Clarice, Steve, James and Paul -- Channel 4's news team. A great bunch of guys, know whut I mean?" Sick of hearing this, Vern knocks the ladder down and Ernest goes sprawling at the end of the commercial. The "50-50 Weather" spot sells forecaster Spann. "Hey, Vernon, washin' the old wagon again, hey buddy?" Ernest chortles. "Kinda like puttin' lipstick on a corpse, ain't it, heh-heh. You're takin' a big chance, Vern. Didn't you see James's pinpoint weather forecast on Channel 4? Golly Bob howdy, that James has got him a computer and he's callin' for a 50-percent chance of rain." Lightning and thunder strike. Half the TV screen turns gray and he other half stays sunny. Ernest pulls out an umbrella. "That James has got a way with numbers, know whut I mean?" he tells Vern. Ernest then steps to the sunny side and advises his pal, "You better wash it over here." Peter Van Sant, a former Channel 8 reporter turned CBS correspondent, did a story on Varney's Ernest commercials at the end of the CBS Evening News last year. Anchor Dan Rather, nearly convulsed with laughter, could barely say goodnight. If the Ernest promos work, Channel 4 will get the last laugh. If not, well, the topsy-turvy station has been a laughingstock before. 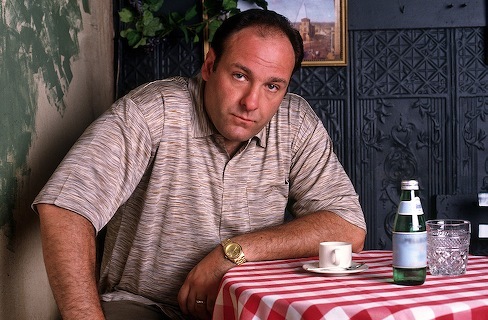 Vintage Gandolfini: King James in a 1999 Sopranos publicity shot. Note to readers: The cast of The Sopranos had their coming-out party with the national media at the 1999 Television Critics Association awards ceremony. Great actors often aren't comfortable in such situations, and James Gandolfini was no exception. Here's how it went down in late July, 1999. PASADENA, Calif. -- On television he plays a mob boss. In person he doesn't like crowds. James Gandolfini, better known as capo Tony Soprano on HBO's The Sopranos, clearly is out of his element amid a small circle of inquiring TV critics. Impeccably dressed in a dark suit and white shirt, he's trying to mind his own business, knowing he can't. Within the hour he'll accept a Television Critics Association award for outstanding individual achievement in drama, sharing the honor with Ally McBeal and The Practice creator David E. Kelley. The day before he learned that he'd been nominated for an Emmy for best actor in a drama series. This is the hard part, though -- a pre-TCA awards reception at which honorees are expected to throw a few quotes around. This much seems immediately obvious: Catch Gandolfini quick or you won't catch him at all. He really doesn't enjoy this stuff. "Overwhelming?" he repeats when the word is thrown at him. "Uh, not really. I don't know what you mean. What has been overwhelming? The show and everything? No, actually, people are very nice. People in New York are very cool. I've only been in L.A. an hour, so I don't know." Gandolfini and his Sopranos cast mates have been flown in from New Jersey by HBO to bask in an unprecedented four TCA awards, including Program of the Year. On the previous day, the show led all comers with 16 Emmy nominations. "This is very nice," Gandolfini says of the acclaim. "But I just think the character's a lot more interesting than me. I just say the words that (creator) David Chase gives me." The cast currently is at work on Episode 2 of The Sopranos' second season. Thirteen new hours will begin airing in January, which is a nice way to kick off the 21st century. Gandolfini says he doesn't know what Chase has in store for his troubled character. Let's keep it that way. "This'll sound a little pompous," he says. "But in life, you don't know what's gonna happen, so why think about what's happenin' down the road in the show? Just let it come as the scripts come." Besides that, "David will kill me if I say anything. I'm the passenger on the train, man." Gandolfini, whose other credits include Get Shorty and A Civil Action, says he was surprised to get the career-making role of Tony. Balding, chunky guys like him usually are consigned to supporting parts. "I thought they would give it to someone who's a little more suave, a little more like these dons are usually," he says. "I'm not like that at all. I was very surprised when I got it. They decided to take a shot, I guess. Of course, I was probably kind of cheap." He's getting antsier now, anxious to escape. When a critic asks him what he likes most about Tony, Gandolfini shoots back, "His Russian mistress." The line gets a laugh and leaves him an opening. "That's about it, right?" he says. "Thank you very much." After the awards, Gandolfini tells an HBO publicist to "get me out of here. Get me out of here now." It's nothing personal, though. "He's a very shy man," says Lorraine Bracco, who plays Tony's therapist, Dr. Jennifer Melfi. "It's very sweet. With me he's an animal, though." She lets loose with a huge hoot of a laugh. Bracco, who received an Oscar nomination for her supporting role in the landmark Mafia movie Goodfellas, is a notably garrulous contrast to the guarded Gandolfini. Quality-wise, The Sopranos is comparable to Goodfellas, she says. "There's something happening. It's exciting. It's thrilling. Somebody asked me if I feel pressure. Absolutely. Not for the Emmys so much, but whether you can continue to do good work, real work, truthful work." Bracco and Edie Falco, who plays Tony's wife, Carmela, are both nominated for best actress Emmys. Falco says she got 42 congratulatory calls and a "stunning bunch of flowers" from Bracco when the nominations were announced last week. For her, enough. "It's a little bit of a necessary evil," she says of her nomination. "Only because I don't do a lot of this and I am not completely in my territory wearing a gown (on Emmy night). The sense of competing is so silly. I would love it if Lorraine won. I would love it if I won. I would love it if we both lost. Winning sounds actually terrifying. You have to go up there, you have to speak and then all this stuff afterwards. I don't know." Falco says she's comfortable, at least for now, with the thought that The Sopranos could go down as a classic, groundbreaking TV series in league with Hill Street Blues and All In the Family. "I can't go there in my head," she says. "Otherwise you can't do the work. We've got to do what we did last year (when the first 13 episodes were filmed). It's a buncha people who are good actors working until the wee hours of the morning laughing our heads off. If you have to stand above it and say this is a classic thing, well, that's just too big a title to put on it." Come to think of it, Gandolfini did say one other thing in this regard. Got a laugh, too. Let it be his exit line, and ours: "I'm sure we'll screw it up" Ha-ha. "But it's not brain surgery. You just do the best you can."